The HR Power Supply is a low-noise electronic power source for the DC motors as found on the TecnoDec, GyroDec and Gyro SE turntables. Adding extra stability to the power supply for the motor, the HR features the novel Never-Connected circuit, and has a user-adjustable speed control on its back plate. Fitting is simple  just unplug the motor lead from the existing supply and connect it to the HR. An IEC mains lead comes supplied. The Tecno Arm A is a fundamental mechanical rebuild of the well-known RB250 tonearm, to which is added monolithic wiring of the highest quality. The arm tube is bead-blasted and perforated, which disperses structural resonances and yields a lower effective mass. The arm wand is internally damped to reduce resonance further, and the headshell is machined flat, to allow true azimuth relative to the bearing cradle. 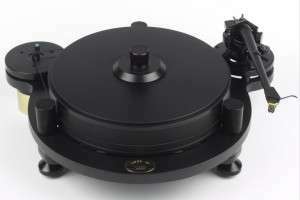 After modification the bearings are re-adjusted for highest possible performance, according to original Rega procedures. One-piece perforated arm casting with internal foam damping Proprietary silver litz cable in a continuous run from cartridge to amplifier PTFE dielectric, metal braided shielding, separate ground wire Silver-plated cartridge clips and phono plugs Two counterweights, matching cartridges of 4-7g and 7-13g Vertical tracking force adjuster in steps of 0.1g Vertical tracking angle adjuster Finger locknut for easy arm removal or VTA adjustment One year warranty The Techno Arm A is also available in black.